Want to learn more about how to use cloth diapers? 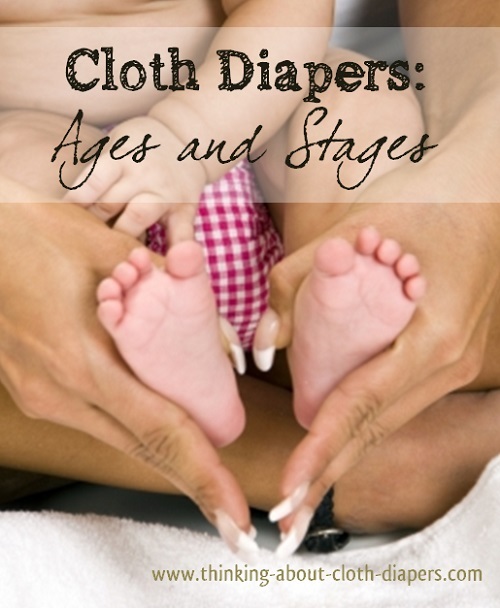 Our Ages and Stages series takes you through cloth diapering from newborn to potty training. "I'd love to use cloth, but I just don't think I have time for that..."
I'll let you in on a little secret... Using cloth diapers isn't as hard as people tend to believe. Cloth diapers are growing more and more mainstream, and it's because good secrets are hard to keep! From the early newborn days right until your little one potty trains, this collection of articles is here to help you learn the ins and outs of cloth diapering through the ages and stages. Newborn Cloth Diaper Rental Programs: Try Before You Buy - Still not sure if you're ready to commit to cloth diapers? Buying cloth diapers can seem like a huge step - especially if you're just not sure that they'll work for you! Cloth diaper trial and rental programs are a great way to test-drive cloth diapers without a large financial commitment. Read on for details about cloth diaper trial programs in Canada and the US. Newborn Cloth Diapers - Are you thinking about using cloth diapers right from day 1? This article includes information on using newborn cloth diapers and lists some of our favorite brands for brand new babies. Cloth Diapers and Formula Fed Babies - You may have heard about how to clean cloth diapers with exclusively breast-fed babies, but what if your baby is fed formula? Here's more information for cloth diapers and formula fed babies. Traveling with Cloth Diapers - While it can take a bit more planning (and yes, courage!) you really can rely on cloth even while traveling. One of our monthly Cloth Diaper Column monthly newsletters is packed with tips for easy travel with cloth diapers. Successful Cloth Diapering Overnight - Tired of getting up with an unhappy and wet baby? You do NOT need to switch to expensive disposable overnight diapers! There are some great cloth diaper options available for night-time diapering. Using Cloth Diapers at Daycare - Love your cloth diapers, but not sure how to use cloth diapers at daycare? It may come as a surprise, but many daycares are still unfamiliar with modern cloth diapers. In this article, we cover how to use cloth diapers at daycare, including tips and suggestions if you need to convince your provider to try cloth. Potty Training: Cloth Training Pants - This article provides more information on what to look for when selecting training pants, plus a comparison of popular trainers. Looking for the perfect cloth training pants? Look no further! What To Do With Your Diapers When They Are No Longer Needed - This article has more information on selling, donating, and re-purposing cloth diapers once you're done with them. You've come to the right place to learn about how to use cloth diapers. You've probably discovered lots of websites that talk about cloth diapers. With so much information available, it can be hard to make a decision. As a new parent, you've got plenty of more important ways you could be spending your time. 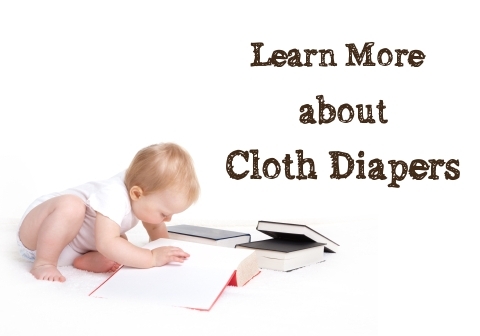 We're here to help you get back on with your day with our simple, unbiased and up-to-date cloth diaper information. When it's all said and done washing is the biggest difference between cloth diapers and disposables. Modern cloth diapers aren't hard to wash, especially once you establish a routine. Thanks to improvements in cloth diapers, detergents, and washing machines, it's easier than ever to sanitize cloth diapers. Choosing cloth diapers doesn't need to create a lot more work for you. 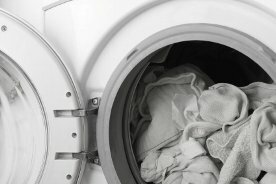 Learn more about washing cloth diapers in this article about washing cloth diapers. We've got the basics on how to wash cloth diapers, including instructions for both front and top-load washers. To get more information on why parents are increasingly choosing cloth diapers, check out our article on cloth diapers vs disposables. Why Are You Thinking About Cloth Diapers? Looking for ideas on how to use cloth diapers to reduce your environmental footprint? Make your cloth diapering experience as green as possible, with our Top Tips for a Green Diaper Experience. Cloth diapers are also a great way to save money. If you would like to learn how to use cloth diapers and to stretch your dollar even further, read our article for ideas on how to save more money with cloth diapers. Congratulations, cloth diapers are a great choice for you and your baby! All cloth diapers are designed with one function in mind! Cloth diaper systems range in cost and convenience, from pre-folds to all-in-ones and hybrids. With such a wide range of great cloth diapering options available, it's easier than ever to use cloth diapers! When you're just starting out, it may seem like cloth diapers come with their own language. Choosing a cloth diaper that works for you is about deciding on how much you want to pay for added convenience. Generally, when you are considering how to use cloth diapers, the more convenient the system (example, all-in-ones), the higher the overall cost for the diaper. But no matter which system you choose, you will likely still find that cloth diapers save money. There's So Much to Learn! What Should I Buy to Start? Not sure what you need to buy? Our Cloth Diapering Checklist gives you more helpful tips and suggestions to make your first cloth diaper shopping experience fun and easy. Thinking about making the switch to cloth? Make your experience easier with our list of 5 Must-Have Cloth Diaper Accessories. If you're thinking about cloth diapers, cloth wipes are something else to consider! Cloth wipes are a great way to save money - and they're much more effective. Read our article on cloth wipes for more information. There's lots of roomy bags out there for you to choose from when you choose cloth diapers. Since cloth diapers are bulkier than disposables, you'll want to make sure you buy one of the bigger bags to pack your stash. We've selected some of our favorite bags that are perfect for cloth diapers! In response to the Real Diaper Association's School of Cloth, we wrote this short article about how to get started with cloth diapers. It's a quick read, and contains links to some of our popular articles! When you first have a baby, even a trip to the doctor's office is an event you plan for. Are you planning a road trip with baby? Whether you're heading out for an hour, or planning to be away from home overnight, traveling with baby is much easier when your diaper bag is well-stocked. Read more for suggestions on on what to pack, in our diaper bag checklist.